An economically priced mounting board for conservation-quality picture framing, mounting, displays and exhibits. 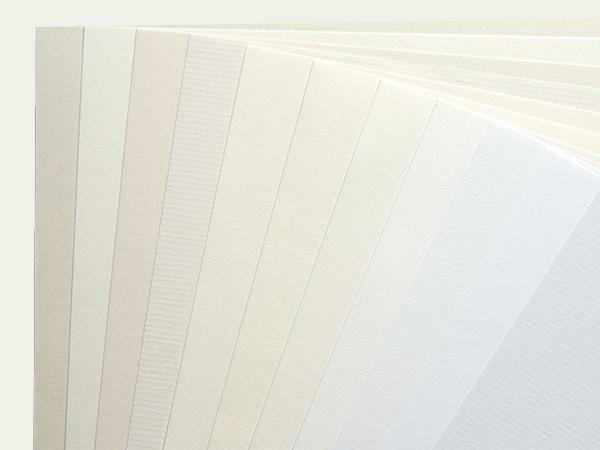 Top surface available in various white shades with high light-fastness, surface structure vellum or ribbed. Base board is white. Cuttings: Rough cuts of formats free of charge for orders > 1 packaging unit (formats can be divided into halves, thirds, quarters, sixths, eighths or ninths). H20, H22 – H25 sales only one unit onwards. Other sizes on request. Please note: The illustrated surface colours and structures match the actual products approximately. For exact colour and surface structures please request for single samples.